Enjoy some relaxing time nestled in the beautiful Okanagan Valley. 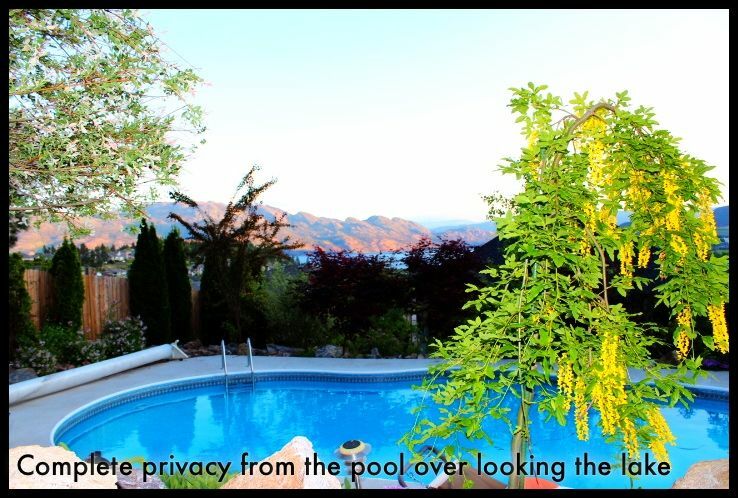 We hope your stay in our beautiful home located in Mission Hill Estates offers the benefits of a comfortable and rejuvenating vacation that the Okanagan is known for. Walk to Mission Hill Winery, home of some of the most renowned Canadian wines. As well, with-in a short drive you can try your hand at several award winning golf courses, tour many distinguished wineries or several small but notable ones. Minutes drive down the mountain will give access to a boat launch for your boat &/or other water craft. If simplicity is your thing you can spend your day on the water or just laze on the many beaches along the lake. Take an afternoon and walk along the boardwalk in Peachland and stop for ice cream, or stay and enjoy one of the many great restaurants along the waters edge. If a quiet night is your thing, stay in, make dinner and enjoy some great Okanagan wine on the Patio or take a dip in the pool. Early in the summer or later into the fall the pool is heated so a dip at night is very refreshing. Enjoy all the amenities of home here at Vineyard Estates....Enjoy! Unlike the many other homes with no privacy, our home is located on a mountain and has a very private back yard as there is no homes behind us, just your own mountain range. Tremendous views of Lake Okanagan and the surrounding area. Mission Hill winery is within walking distance and the bells of the tower can be heard ringing every hour! Fully equipped kitchen....prepare the most fantastic meals and eat in the tranquility of your own private backyard deck. Lawn area for kids to play! Master Suite has private balcony for enjoying a glass of wine in the evening or a cup of coffee in the morning. Enjoy complete privacy by your heated pool with no homes behind us! This house was custom built with a gourmet kitchen, a stunning living room and fabulous master suite. A very special place is up above all the roof tops, in the back yard, while lounging in the private heated pool look out and take in the spectacular views of beautiful Lake Okanagan A truly unique home with all the amenities of home! This listing is for a 3 bedroom/2 bath but we can also open 1 extra bedroom with shared full bathroom and kitchen for your stay if you needed. Please call us for more information. Cozy home, perfect for family Christmas holiday . We really enjoyed the well appointed house during our stay over the holidays. It accommodated our family of 5 well and was within a short drive of all amenities. The jacuzzi tub was a real treat! The host was quick to respond with any questions. We hope to come back and enjoy the house and property, and pool, during the summer months! We had a great time! The pool was a favourite among the kids! The location was perfect for winery touring and tastings! The location of the home was perfect with a pool, beautiful views and short access to all required amenities. We rented the whole house to accommodate our family of 7 Adults, which was nice to find a home for this. Upon our arrival there was no walk through prior to our stay at the home, the house was not clean in what our idea of a clean home is. The house is showing its age requiring some repairs, both patio screens to be replaced, toilet paper holder held with duck tape, broken shelving in master bedroom shower and shower controls difficult to get proper water temperature, fan in master bedroom with no speed control as chain is missing, all beds that we used were uncomfortable and should be replaced due to usage, pool chairs (broken) that should be replaced along with the pool cover and the pool patio table umbrella. Would of be nice to have some lounge chairs at the pool side. dinning room chairs becoming unstable as well. The main floor looked like some repairs were started and not completed. Barbecues on the main floor were in terrible condition, did not use, however one upstairs was great. We were not pleased that we were responsible for pool maintenance as this was not a requirement at other vacation homes. We are not a family to take annual vacations together, it was 8 years since our last, so our expectations may be a little higher. We excepted how things were and made the best of it and we enjoyed our 7 day(July 20-27, 2018) stay at the house. We Loved this house!! The owner is very friendly and helpful with the pool! The kitchen is stocked with everything! We also rented the basement and it gave us so much extra room. We can't wait to rent this house again! Hi, Heather, thank you very much for the review and all helps to maintain the house and pool tidy and clean during your stay! It’s my greatest pleasure to host your family and friends! And absolutely welcome back again! Several fantastic Okanagan wineries in area, perfect for wine tastings and touring! We do have 2 extra bedrooms with full bathroom and full kitchen and living room if needed. The cost for a week or the stay if less than a week will be $500 extra.